The Paris-Brest-Paris (PBP) cycling race is a 1200 kilometre event first introduced in 1891 as a means to promote the practicality of the bicycle [The term, bicycle, was coined in France following the introduction of the first really popular and commercially successful design in the early 1860s]. The inaugural ride attracted over 400 entrants—foreigners and female cyclists were refused—and was won by Mr Charles Terront in a time of 71 hours 22 minutes. International riders were allowed to compete from 1901, and in 1931 records of female riders began to appear, with Mlle Vassard recognised as the first solo woman to complete the PBP, in a time of 93 hours 25 minutes. Over time the popularity of the event waxed and waned, and as the focus shifted to better accommodate touriste routiers attendance by professional athletes began to decline. The 1951 race, which was the last to see participation by pro-riders, was won by Frenchman Maurice Diot in 38 hours 55 minutes, a record time that remains unbeaten to this day. Lack of interest during the late-1950s forced the race to be cancelled for a number of years, but by the late 20th century the event had regained its popularity, with 3281 participants signing up for the 1991 centenary ride. The most recent edition held in 2011 saw 5225 randonneurs register to take part in what is now officially an amateur event where entrants are encouraged to be polite, 'go fast if you like', obey the rules of the road, and above all, have fun. To commemorate the 1891 race, rumour has it that a French pâtissier created a wheel-shaped dessert that became popular among many riders due to its energy-giving value. Known today as the Paris-Brest, this decadent treat is made from rings of choux pastry filled with a rich, praline-flavoured cream. More-so a pastry of leisure than the elite athlete's fuel of choice (although, who wouldn't love to see Bradley Wiggins chowing down on one as he summits the Alpe-d'Huez?) the Paris-Brest is best enjoyed fresh and, in an ideal world, delivered by bike. Preheat the oven to 180°C. Lightly butter a baking sheet and dust it with flour. Combine the water, sugar, salt and butter in a medium saucepan and bring to a simmer over medium heat. When the butter melts remove the pan from the heat and whisk in the flour all at once. Continue whisking until the dough pulls away from the pan to form a ball. Return the pan to medium heat and beat for 30 seconds to dry out the dough. Remove the pan from the heat and break in 2 of the eggs, one by one. Lightly beat the remaining egg and whisk in as much as needed to make a dough that is very shiny and just falls from the spoon. Keep the left-over whisked egg for the glaze. Make circles on the baking sheet with a 7 cm cookie cutter, spacing slightly apart, to use as guides. Spoon the dough into a pastry bag fitted with a 8-mm plain tip and pipe the dough into rings. 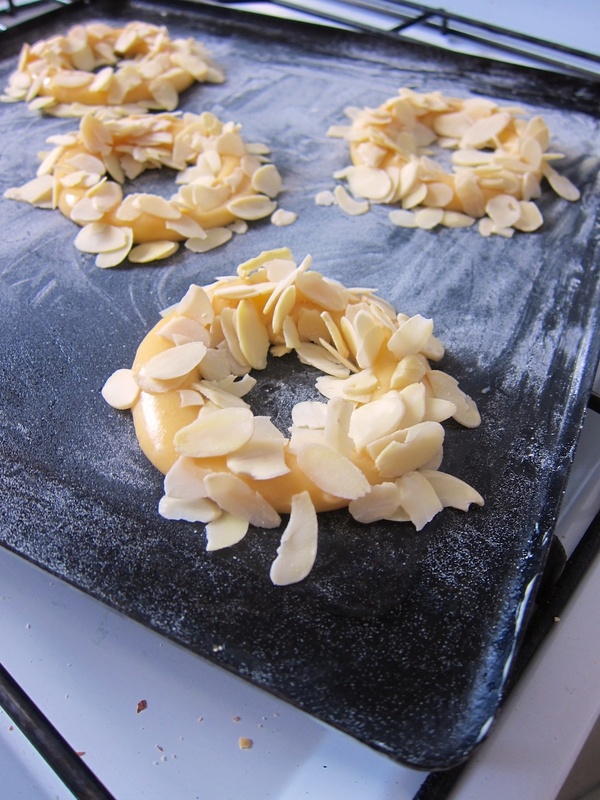 Lightly brush with egg glaze and sprinkle with sliced almonds, tilting and tapping the baking sheet to remove any excess. Bake for 25 minutes or until puffed and lightly browned. Transfer the pastry rings to a rack and let cool. 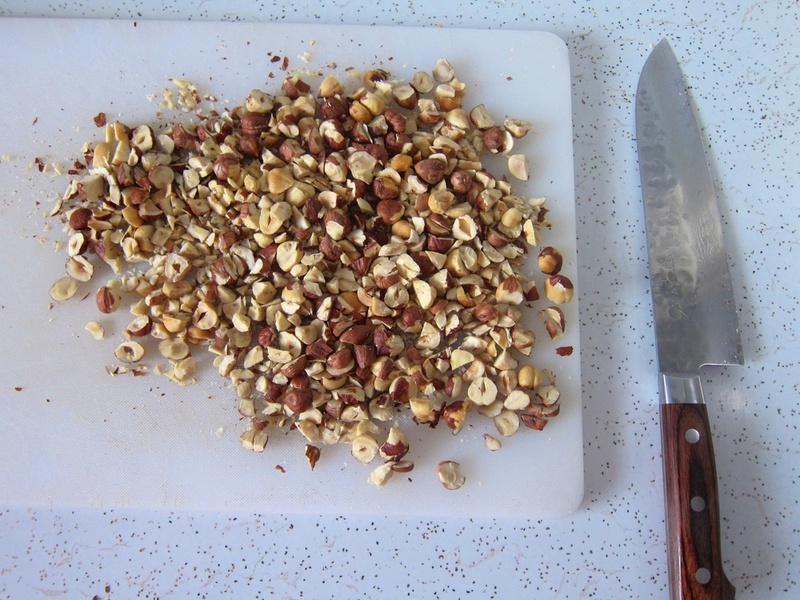 Cut the choux pastry rings horizontally in half using a long serrated knife. Spoon the mousseline cream into a pastry bag fitted with an 8-mm star tip and pipe around the bottom half of each pastry. Carefully place the pastry tops over the cream and dust lightly with confectioners' sugar. ** I have chosen not to include Felder's recipe for mousseline cream here, which you may have noticed is a rather detailed preparation involving crème pâtissière, an Italian-meringue-based crème au beurre (incorporating an egg-yolk buttercream, no less) and some hazelnut-praline paste. 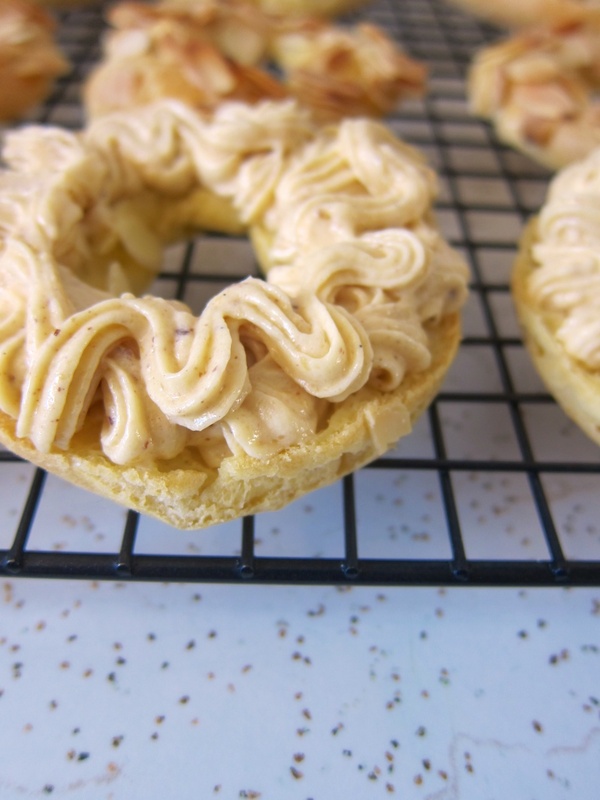 The Paris-Brest are best filled just before serving, and while the praline cream is certainly worth the effort a simple pastry cream would also make a delicious filling. If you don't have your own favourite recipe, take a look at some good examples of a basic vanilla crème pâtissière here, or here.